AOR Rhodiola is authentic Russian Rhodiola rosea, an herb with extensive traditional use in Siberia for adaptation to the rigors of life on the tundra of North-central Asia. 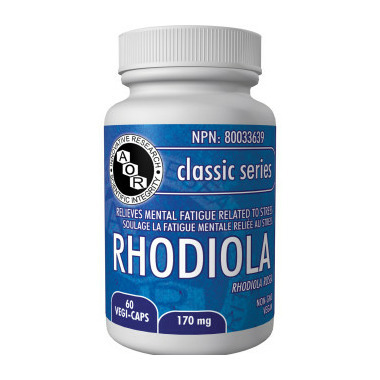 Rhodiola, a powerful adaptogen, helps support focus, cognitive function, mental and physical stamina and helps relieve symptoms of mental fatigue related to stress. Directions: Adult Dosage: Take 1 capsule twice daily on an empty stomach, not immediately before bedtime, or as directed by a qualified health care practitioner. Cautions: Consult a healthcare practitioner if you are taking antidepressant medication, hormone replacement therapy (HRT) or birth control pills, if symptoms persist or worsen, or for use beyond 6 weeks. Do not use if you have bipolar spectrum disorder. May cause irritability and insomnia, in which case, discontinue use. I really like this product. I am taking it to help reduce stress. Very pleased with AOR. My naturopath had prescribed the AOR rhodiola to help me with adapting to a very stressful time at work. I actually do feel it is helping, and noticed this within a few days of starting it. I trust the quality of the brand. Just a note - try not to smell it when you open the bottle as it's a bit unpleasant! Great product and great company to order from. Excellent product. Tried a different brand of adaptogen previous to trying this one and it disagreed with me. AOR works great.